NEW ORLEANS — The best of the best in collegiate track & field showcased their talent last week at the NCAA Division I Outdoor Championships at Hayward Field. Ten men stood out the most in Eugene, Oregon — and also throughout the entire track & field cycle — and were named semifinalists for The Bowerman Award on Thursday after a vote by The Bowerman Advisory Board. 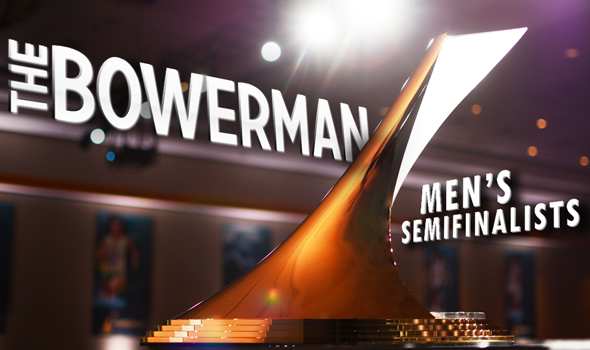 Here are those 10 men The Bowerman Advisory Board will pull from to get the three finalists in one week’s time: Oregon’s Devon Allen, Texas A&M’s Donavan Brazier, Oregon’s Edward Cheserek, Texas’ Ryan Crouser, Arkansas’ Jarrion Lawson, Mississippi State’s Brandon McBride, Oklahoma State’s Nick Miller, Akron’s Clayton Murphy, Texas A&M’s Lindon Victor and Wisconsin’s Zack Ziemek. Donavan Brazier FR Texas A&M Mid-Distance Grand Rapids, Mich.
Each of those men — with the exception of Crouser, who exhausted his eligibility before the outdoor season began — stood out in some fashion in Eugene, Oregon last week. Allen continued to prove no worse for wear after an injury stole his entire 2015 season. The Oregon sophomore captured his second hurdles title of the year when he ran away from the field in the 110 hurdles. Allen also won the 60-hurdles crown indoors. Brazier wrote his name in the record books in a big way when he took down Jim Ryun’s 50-year-old standard in the 800 meters. Following a quick opening lap (50.48) in which McBride set the pace, Brazier pulled away over the final 150 meters and posted a time of 1:43.55, which topped Ryun’s old mark of 1:44.3 by nearly a full second. Brazier is the first freshman semifinalist since Allen, Trayvon Bromell and Cheserek in 2014 and the first freshman to win the 800-meter crown since Paul Ereng in 1988. Cheserek, the only returning semifinalist, earned his third consecutive title at 10000 meters and came back two days later to win the 5000. A bit of history came with that double as the Oregon junior became the second man in NCAA history to sweep the indoor and outdoor distance races in a single academic year (2009 Bowerman winner Galen Rupp is the other). Lawson put his name in the same sentence as the great Jesse Owens with what he did at Hayward Field. The Arkansas senior joined Owens as the only men in NCAA history to win the 100, 200 and long jump titles. Lawson also joined forces with three teammates to place third in the 4×100. All told, Lawson added 31.5 points to the Razorbacks’ total and broke the NCAA modern-day scoring record. Unfortunately for McBride, he ran into the buzz saw that is Brazier — but his feats in Eugene shouldn’t be overlooked. McBride is now the third fastest collegian in history (1:44.50), which should pair well with the fourth fastest mark all-time (1:44.63). This is his second time being a semifinalist in three years (2014). Miller only competed three times this season — Big 12 Championships, NCAA West Prelims and NCAAs — but made them all count. Last week, the Oklahoma State senior ended his collegiate career with an individual title in the hammer throw. Murphy chose to jump up in distance for the NCAA postseason (800 to 1500) and it paid off. The former Akron standout outkicked the field in the semifinals and then made quick work of the final when he ran the ninth fastest time in collegiate history (3:36.38). Murphy is the second semifinalist from Akron in as many years (Shawn Barber went on to be a finalist in 2015). Victor and Ziemek waged a tremendous two-day battle in the decathlon. In the end it was Victor who was crowned champion as he scored 8379 points, the fifth largest total in collegiate history. Ziemek finished second with 8300. Next week, three of these men will be named finalists for the most prestigious award in collegiate track & field.